Can PIKO TT models be operated with the new TT close coupler of the company Tillig*? Our TT locos (Taurus, Hercules and BR 151) are equipped with a standard NEM 358, but have no close coupler guide. This is why, when using the new Tillig* close coupler and the close coupler from other manufacturers, the distance between the locomotive and waggons becomes very short so that "over-buffering" and associated derailment could happen. To solve this problem we offer under the article numbers #46040 and #46041 corresponding close coupling adapter. All other models have close coupler mechanisms and therefore require no adapter. 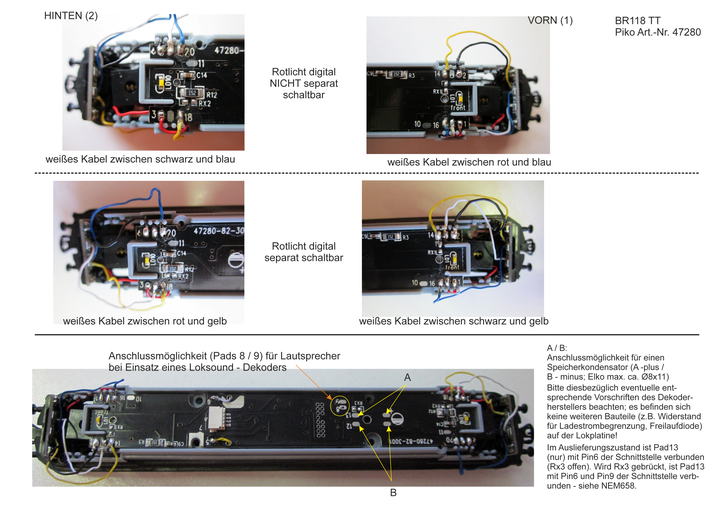 TT Talent II - digitalized with PluX16 Decoder (46121) - problem with interieur lights From the interface, the PluX16 decoder provides two additonal function outputs. From the NEM those outputs are assigned to the red train-end-lights. But to realize further functions like interieur lights we had to find another solution. The PIKO TT Talent II has an automatic white-red light change per direction, where the red lights cannot be controlled separately. But by default the PluX16 decoder is programmed to "create" a light change according to the NEM, where the output A1 will only be active in one direction. Due to this the interieur lights are working incorrect. To make the interieur lights shine permanently, please change CV107 from 3 to 0. Now the interieur lights can be controlled seperately via F1.